The final picking of candidates who submitted their nomination papers for the 11th parliamentary elections to contest for the 300 seats, is being started from Sunday. The selection will begin on Sunday from 9:00 am till afternoon. Election Commission (EC) will finalize the candidate list. However, the candidates who have been contesting in the election will have the opportunity to withdraw their candidacy till December 9. Later on December 10, the symbol will be allocated to them, after completing the list of candidates for 300 constituencies. According to the Election Commission sources, a total of 3,056 candidates submitted their nomination papers to the Returning Officer’s office. Of them, 281 from Awami League, 696 from BNP, 233 from Jatiya Party, and 1,047 from other political parties. In total, 2,569 candidates are from political parties. And, 498 people have filed nominations as an independent. 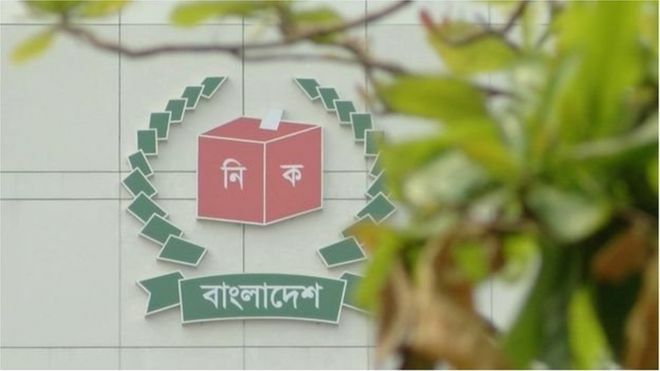 According to sources, the two major parties of the country -- the ruling Awami League has given the nominations in 264 seats and the BNP which boycotted the 10th parliamentary elections has given the nomination in 295 seats. Of these, 361 candidates in Rangpur division, 353 in Rajshahi, 351 in Khulna, 182 in Barishal, 236 in Mymensingh, 708 in Dhaka 708, 177 in Sylhet and 688 in Chattogram division, submitted the nomination papers. The highest nomination papers have been deposited in Dhaka-8 seats, 22 candidates submitted nomination papers. And the lowest nomination has fallen to 4 in the Magura-2 constituency. Out of this, 39 have online deposits. However, only 23 nominations have been submitted in compliance with the rules and regulations. The nomination papers of these candidates will be selected from Sunday. All the 39 registered parties of EC have submitted nomination papers for contesting this election. Among them, Bangladesh Awami League (Boat)- 281, Bangladesh Nationalist Party-BNP (Paddy Sheath)- 696, Jatiya Party-Japa (Plow)- 233, Jatiya Party-JP (By-Cycle)- 17, Communist Party of Bangladesh-CPB (Scythe)- 77, Bangladesh Samajtantrik Dal-BSD (Ladders)- 49, Jatiya Samajtantrik Dal-JSD (Torch) -53, Gano Forum (Rising Sun)- 61, Bikalpa Dhara Bangladesh (Kula) -37, Jatiya Samajtantrik Dal (Star)- 51, Islami Andolan Bangladesh (Hand Fan)- 299, Bangladesh Khilafat Andolan (Banyan tree)- 26, farmers Krishak Sramik Janata League (Towels)- 37, Liberal Democratic Party (Umbrella) -15 people. Besides, the Bangladesh Sammobadi Dol-ML (Wheel)- 3, Ganotontri Party (Pigeon)- 8, Bangladesh National Awami Party (Bothy House) -14, Workers Party of Bangladesh (Hammer) -33, Zaker Party (Rose) -, Bangladesh Jatiya Party-BJP (Cart) -11, Bangladesh Tarikat federation (Flower Wreath)- 20, Bangladesh Muslim League (Hurricane)- 49, National People's Party (Mango)- 90, Jamiyat Ulama Islam Bangladesh (Palm Trees)- 15, Gano Front (Fish)- 16, Pragatisheel Democratic Party-PDP (Tiger), Bangladesh NAP (Cow) -4, Bangladesh Jatiya Party (Jackfruit)-13, Islamic Front Bangladesh (Chair)- 28, Bangladesh Kalyan Party (hand watch)- 5, Islami Oikya Jote (Minar) - 32, Bangladesh Khelafat Majlim (Rickshaw)- 12, Bangladesh Islami Front (Candle) - 21, National Democratic Party - JAGPA Hukka) -6, BP of Bangladesh Provisional Democratic Workers’ Party (spade) -30, Khilafat Majlis (wall clock) 12 persons have submitted nomination papers.